Paroxysmal nocturnal hemoglobinuria (PNH) is a rare, acquired, potentially life-threatening disease of blood, characterized by complement-induced intravascular hemolytic anemia and thrombosis. PNH is a consequence of nonmalignant clonal expansion of one or several hematopoietic stem cells that have acquired a somatic mutation of PIG-A gene, located on chromosome X. Progenies of the affected stem cells are deficient in glycosyl phosphatidylinositol (GPI)-anchored proteins. Deficiency of the GPI-anchored complement regulatory proteins such as CD55 and CD59 accounts for the intravascular hemolysis that is the primary clinical manifestation of the disease. Although rare, both acute and chronic kidney involvement can occur in PNH.,,,,, Renal failure as the primary presentation leading to subsequent diagnosis of PNH is even rarer.,, We received three cases that presented with acute or chronic renal insufficiency and were suspected as PNH on viewing their renal biopsy in light of their clinical and laboratory details. All the three cases were confirmed as PNH on the basis of flow cytometric analysis of CD55 and CD59. The renal biopsy findings in these patients were worth highlighting and prompted us to elaborate on the spectrum of morphologic and physiologic renal abnormalities in patients with PNH. A 52-year-old, normotensive, nondiabetic male presented with swelling over bilateral lower limbs, generalized weakness, and breathlessness, off and on for the past 5 years. All his complaints had aggravated for the past 2 months. There was no history of decreased urine output, passage of dark-colored urine, joint pains, skin rashes, or sore throat. On examination, he had pallor. There was no icterus or hepatosplenomegaly. His blood pressure (BP) was 130/86 mmHg. Laboratory investigations and urine findings are shown in [Table 1]. Ultrasonographic examination showed normal-sized kidneys with subtle increase in echotexture and maintained corticomedullary differentiation. In view of unexplained renal insufficiency, he underwent a kidney biopsy. Light microscopy of the kidney biopsy showed eight glomeruli, of which two were globally sclerosed. The tubular epithelial lining was denuded and lumen showed the presence of granular orange-pink casts, which stained positive for iron. Tubular epithelial cells showed brown pigment deposits, which also stained positive for iron. There was mild interstitial fibrosis. Direct immunofluorescence for IgG, IgA, IgM, C3, and fibrinogen on renal biopsy was negative. The diagnosis of acute kidney injury with hemosiderin deposits in renal tubular cells suggestive of hemoglobinuria, superimposed on chronic kidney disease (CKD), was given. Hematological investigations to rule out enzyme or membrane defects in red blood cells leading to hemolysis were negative. Coombs test was negative. Intravascular hemolysis due to PNH was suspected in view of the above findings. Ham's and sucrose lysis tests were positive. 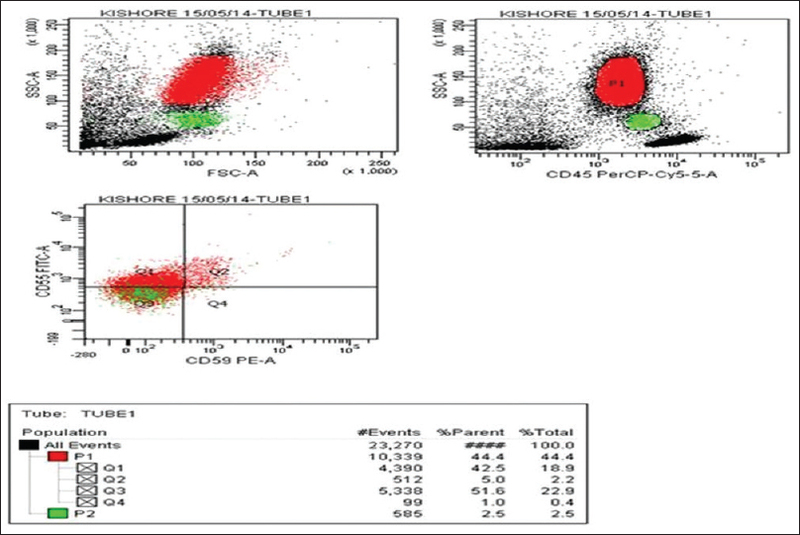 Flow cytometric evaluation for CD55 and CD59 confirmed the diagnosis of PNH [Figure 1]. The patient underwent four cycles of dialysis in 12 days, after which his blood urea was 127 mg/dl and serum creatinine stabilized at 3.2 mg/dl. A 40-year-old male presented with facial puffiness and swelling over bilateral lower limbs for 10 days and decreased urine output for the past 7 days. He also had a history of fever for 2 weeks prior to the onset of these complaints. There was no history of passage of dark-colored urine, burning micturition, joint pains, skin rashes, sore throat, or similar complaints in the past. He had pallor and mild icterus. His BP was 128/82 mmHg at the time of admission. Laboratory investigations and urine findings are shown in [Table 1]. Urine showed numerous hyaline and coarse granular casts, which stained positive for iron [Figure 2]. Renal biopsy revealed 17 glomeruli, of which 6 were globally sclerosed. Few glomeruli showed mild mesangial widening and four revealed periglomerular fibrosis. Proximal convoluted tubules (PCT) were dilated and showed degeneration and flattening of epithelium. Many tubules showed golden brown pigment, which was confirmed to be iron on Prussian blue stain. Few tubules showed pink-orange casts. Interstitial edema was present. Blood vessels showed marked arteriosclerotic changes. Direct immunofluorescence for IgG, IgA, IgM, C3 and fibrinogen was negative. A diagnosis of acute kidney injury with hemosiderin deposition secondary to hemoglobinuria along with chronic renal insufficiency and vascular changes reflecting benign nephrosclerosis was made. In view of negative Coombs test and after ruling out the other causes of intravascular hemolysis, a diagnosis of PNH was suggested and later confirmed on flow cytometry. This patient underwent five cycles of dialysis in 15 days, following which his serum creatinine came down to 3 mg/dl. A 28-year-old male presented with fever for 10 days and swelling over bilateral lower limbs for 3 days. He had pallor but no icterus on general examination. Laboratory investigations and urine findings are shown in [Table 1]. Kidney biopsy showed 15 glomeruli, all of which were unremarkable. Tubules showed patchy epithelial damage with flattening of epithelium, loss of brush border, nuclear hyperchromasia, and regenerative changes. Some tubules contained pink-orange casts. Some tubular epithelial cells demonstrated the presence of golden brown pigment [Figure 3]a, positive for iron stain [Figure 3]b. Interstitium showed mild focal edema and inflammation. Blood vessels were unremarkable. A diagnosis of acute tubular necrosis, secondary to hemoglobinuria, was suggested. The possibility of PNH was suggested, which was confirmed on flow cytometric analysis of CD55 and CD59. The patient recovered on conservative management. Renal involvement in PNH is clinically unapparent. Yet patients of PNH have been found to have both acute and chronic renal insufficiency unattributable to other diseases.,,,,, All the three patients in our study presented primarily with renal complaints and were suspected as PNH on subsequent evaluation of urine sediment and renal biopsy. Renal biopsy findings in these patients had a wide spectrum of findings. Additional histologic findings in the tubules include deposition of urate crystals in the proximal convoluted tubular cells. Papillary necrosis can also be seen. Various mechanisms of tubular damage due to hemolysis have been contemplated. Clark et al. proposed that besides hemoglobin, other factors such as microinfarcts and interstitial fibrosis play a contributory role in renal damage in these patients. Zager and Gamelin demonstrated that hemoglobin filtered from the glomerulus after an episode of hemoglobinuria was converted into methemoglobin in the acid milieu of the distal tubule, which led to its precipitation. The occlusion of the distal tubule by the precipitates causes stasis of urine and allows greater time for endocytosis of hemoglobin from the PCT, and the iron released from its dissociation could cause free radical injury. Chronic kidney disease can also be seen in these patients.,, In a review of 19 patients, 12 demonstrated abnormal creatinine clearance in the chronic steady state. The presence of interstitial fibrosis and glomerulosclerosis in two of our cases is a testimony to this fact. We opine that repeated toxic injury to the basement membrane of the tubules leads to punching of holes in the basement membrane and subsequent percolation of the glomerular filtrate into the interstitium, giving rise to inflammation and fibrosis. 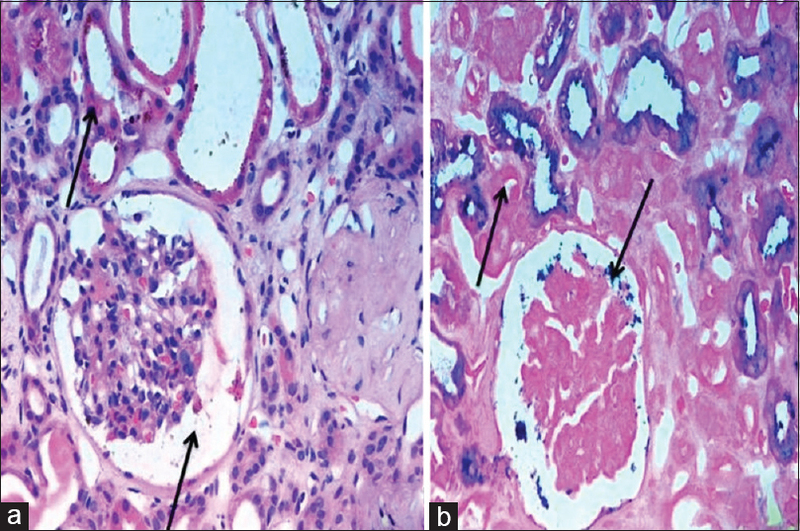 Thrombosis of small vessels in the kidney in PNH leading to microinfarcts adds to the injury. At the physiologic level, the defects can range from a mere defect in urine-concentrating ability of the tubules to AKI, which is a sign of very early renal failure as stated by Dies et al. Riley et al. have demonstrated that there is persistent hyperchloremic metabolic acidosis in patients with PNH. Systemic acidosis further promotes hemolysis in PNH and consequently a vicious cycle is established. There was arteriosclerosis in one of our patients although he was relatively young and normotensive. The autopsy findings of infarction, papillary necrosis, and interstitial scarring in Clark et al's. review indicate that diffuse vascular damage occurs in the PNH kidney. It is likely that this microvascular insult affects the counter-current multiplier system and is responsible for the hyposthenuria in PNH. Vascular sclerosis in PNH can be attributed to the paucity of nitric oxide, which leads to intrarenal vasoconstriction. Also important in the context of renal damage is venous thrombosis because of sludging of erythrocyte ghosts in PNH. This causes microinfarcts and interstitial scarring responsible for chronic kidney disease in PNH patients. CKD was seen in two out of three patients, as evidenced by glomerulosclerosis and interstitial fibrosis. Glomerulosclerosis may occur secondarily due to repeated tubular damage and vasoconstriction. Periglomerular fibrosis was also evident in one case. At the physiological level, reduced creatinine clearance is observed due to tubular obstruction and intrarenal vasoconstriction. However, Kümpers et al. have raised questions on attributing these morphologic changes to siderosis in PNH, thereby implicating other factors such as chronic hypertension in the pathogenesis. We opine that intrarenal hypertension itself could be a manifestation of hemoglobin toxicity due to PNH. However, it is essential to note that morphological changes of chronic renal damage do occur in PNH even without the presence of systemic hypertension. Acute or chronic renal failure is not a common way of primary presentation in PNH, yet both acute and chronic renal dysfunction can occur in PNH patients. Renal biopsy in these patients presents a variety of morphological changes, as highlighted above. Most patients have moderate-to-heavy siderosis in their kidneys, while others can have acute tubular necrosis with or without evidence of CKD as manifested by interstitial fibrosis and glomerulosclerosis. Yet other patients can show arteriosclerosis or papillary necrosis. Mr. Rajesh Pathak for putting up flow cytometry for this case. Parker C, Omine M, Richards S, Nishimura J, Bessler M, Ware R, et al. Diagnosis and management of paroxysmal nocturnal hemoglobinuria. Blood 2005;106:3699-709. Rubin H. Paroxysmal nocturnal hemoglobinuria with renal failure. JAMA 1971;215:433-6. Chow KM, Lai FM, Wang AY, Chan YL, Tang NL, Li PK. Reversible renal failure in paroxysmal nocturnal hemoglobinuria. Am J Kidney Dis 2001;37:E17. Zachée P, Henckens M, Van Damme B, Boogaerts MA, Rigauts H, Verberckmoes RK. Chronic renal failure due to renal hemosiderosis in a patient with paroxysmal nocturnal hemoglobinuria. Clin Nephrol 1993;39:28-31. Satish S, Rajesh R, Kurian G, Seethalekshmi NV, Unni M, Unni VN. Recurrent acute renal failure. Indian J Nephrol 2010;20:217-9. Nair RK, Khaira A, Sharma A, Mahajan S, Dinda AK. Spectrum of renal involvement in paroxysmal nocturnal hemoglobinuria: Report of three cases and a brief review of the literature. Int Urol Nephrol 2008;40:471-5. Qi K, Zhang XG, Liu SW, Yin Z, Chen XM, Wu D. Reversible acute kidney injury caused by paroxysmal nocturnal hemoglobinuria. Am J Med Sci 2011;341:68-70. Suzukawa K, Ninomiya H, Mitsuhashi S, Anno I, Nagasawa T, Abe T. Demonstration of the deposition of hemosiderin in the kidneys of patients with paroxysmal nocturnal hemoglobinuria by magnetic resonance imaging. Intern Med 1993;32:686-90. Clark DA, Butler SA, Braren V, Hartmann RC, Jenkins DE Jr. The kidneys in paroxysmal nocturnal hemoglobinuria. Blood 1981;57:83-9. Kiran M, Sonal S. Urine cytology in paroxysmal nocturnal hemoglobinuria. 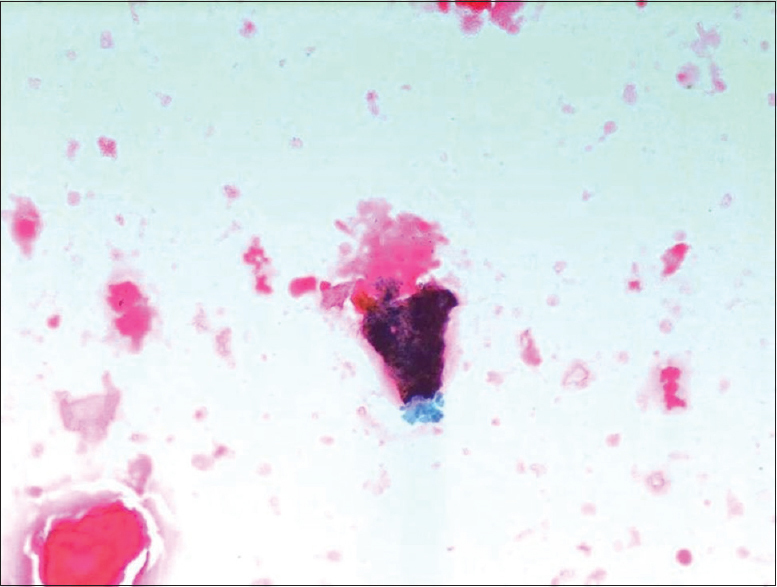 Diagn Cytopathol 2012;40:804-5. Chen SC, Hung CC, Hsu CP, Chiu YW, Liu YC, Tsai JC, et al. Recurrent acute renal failure in a patient with aplastic anemia-paroxysmal nocturnal hemoglobinuria syndrome: A case report. Kaohsiung J Med Sci 2007;23:579-83. Zager RA, Gamelin LM. Pathogenetic mechanisms in experimental hemoglobinuric acute renal failure. Am J Physiol 1989;256(3 Pt 2):F446-55. Dies F, Lisker R, Rivera A. Nocturnal paroxysmal hemoglobinuria. II. Change of renal function in a clinical case. Rev Invest Clin 1961;13:219-29. Riley AL, Ryan LM, Roth DA. Renal proximal tubular dysfunction and paroxysmal nocturnal hemoglobinuria. Am J Med 1977;62:125-9. Kümpers P, Herrmann A, Lotz J, Mengel M, Schwarz A. A blue kidney – Chronic renal failure as a consequence of siderosis in paroxysmal nocturnal hemoglobinuria? Clin Nephrol 2006;66:210-3.